Consumer interest in social shopping is up around the world, with almost half of consumers (45%) actively recommending products on social media sites, according to a global survey by e-commerce marketplace Rakuten. It found the UK saw the second highest international growth, with just over a third of consumers (36%) sharing products with their social network, up 11% since August 2012. However, it was the US in pole position for growth in social shopping adoption, with 39% of shoppers sharing products with friends on social platforms, up 20% since 2012. 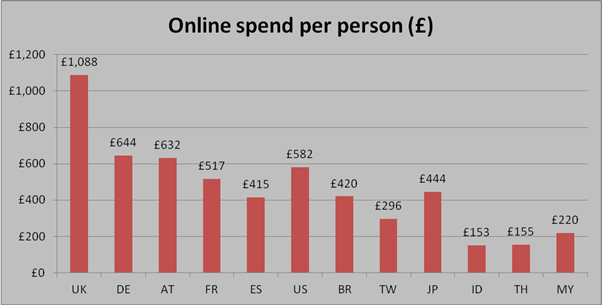 British shoppers were also found to be the biggest online spenders, parting with an average of £1,088 per person each year, ahead of the US, France, and Germany. On average, spend across the markets surveyed was £464 per person in 2012. At the other end of the spectrum Indonesians had the lowest average spend, parting with somewhere in the region of £220 per person in 2012 (see chart below right). Adam Stewart, marketing director, Rakuten’s Play.com, said: “At Rakuten’s Play.com, social platforms were responsible for generating £1.8m of direct sales in 2012, and this growth has been boosted by a 122% increase in orders from social networks specifically over the last six months. When it comes to shopping on mobile, Indonesians continued be the most mobile shoppers, with 14% of consumers reporting they mostly shop online using a smart phone, tablet, or other mobile device, said researchers. The UK leads the usage of mobile among Western countries with over one in 10 (12%) people regularly using a smart phone, tablet, or other mobile device to shop, followed by the US (10%), and Spain (9%). Austria (46%) and Germany (46%) lead the way in preferring to stick with the bricks and mortar experience, the study found. However, the survey also found consumers in Brazil and Taiwan prefer the shopping experience online to in-store (29% of Taiwanese and 26% of Brazilian respondents). In the UK, consumers are increasingly enjoying the online shopping experience to in-store, with just under a quarter of consumers (23%) preferring online, which is up 3% on August last year. However, slightly more (27%) still prefer to visit a bricks-and-mortar store to make their purchase, with the remaining consumers reporting the experience was the same or depended on the situation.